Gluten Free Vegan Coconut Pineapple Scones are dairy-free and egg-free. This post discusses using ratios as a more accurate way to bake. I am so pleased to be participating in this month’s Gluten Free Ratio Rally, founded by Shauna from the Gluten Free Girl, and hosted this month by Lauren of Celiac Teen. This month’s assignment is scones, something I have made over the years in various forms. When I first learned to make scones about 10 years ago, I used the traditional ingredients: white flour, butter and cream. However, as I became more health conscious, I stopped making scones altogether. Only recently did I revisit scone making after I discovered my 8-year old son was allergic to gluten, dairy and eggs, and also should avoid yeast in his diet. 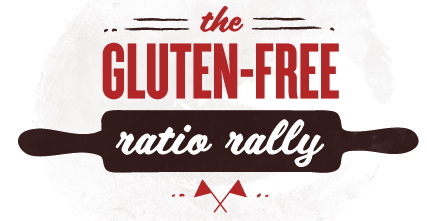 When I first came across the Gluten-Free Ratio Rally last month, I was intrigued. The concept behind this Rally is that once you understand what the proper ratios are for key ingredients in a recipe (e.g., flour, fat, liquid, egg), whether it’s for pancakes or quick breads, you can easily substitute ingredients and be assured consistent results each time. These ratios are by weight, however, not measured in cups and spoons as most of us are used to. 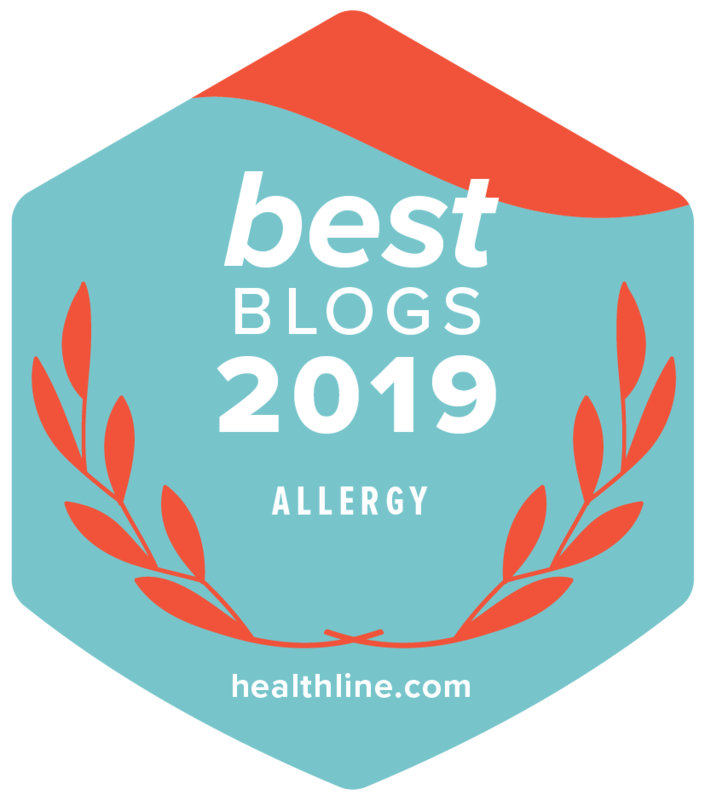 Different flours have different weights, and this is especially true in gluten-free baking, where flours range from lighter flours like tapioca starch to denser bean flours. 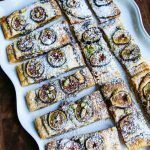 As a fairly new gluten-free baker, I knew that participating in the Gluten-Free Ratio Rally would be a wonderful opportunity for me to learn how to bake with ratios, and bring more consistency to my gluten-free baking, as well as to meet a group of talented gluten-free bakers. 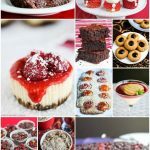 I’ve always baked using measuring cups and spoons, and although I have read that the more accurate way to bake is to weigh out the ingredients, I have yet to bake using a kitchen scale. 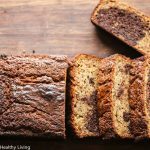 Over the years, I had read that serious bakers (and professional bakers) weigh their ingredients, and although I was curious, I wasn’t sure it was worth the trouble for a home cook like myself…until I started baking gluten-free. Before I started baking gluten-free, I never had trouble substituting whole wheat flour for white flour when I used measuring cups. However, during the past several months as I’ve experimented with gluten-free baking, I’ve had a number of successes, and a number of bloopers. My natural tendency is to take a “normal” recipe and substitute gluten-free flours for the wheat flour called for in a recipe, cup for cup, not gram for gram, or ounce for ounce. 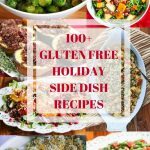 However, after reading through the collection of posts from last month’s Gluten Free Ratio Rally, it became obvious that the most reliable way to bake consistently is to weigh all the ingredients out. In this way, any flour, fat or liquid can be mixed or matched in a recipe. 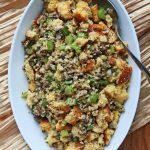 Millet flour can be mixed with quinoa flour and brown rice flour, olive oil can be substituted for butter, applesauce can be substituted for eggs or some of the fat. Now that I understand this concept, it’s no wonder I had a few bloopers when I started mixing a variety of gluten-free flours, all with different densities. 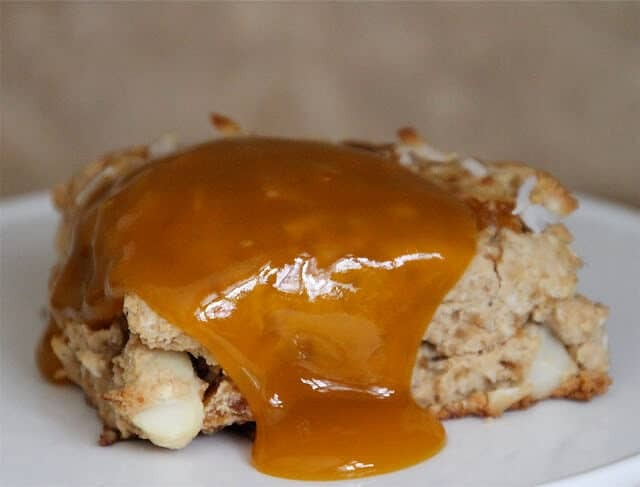 As I started putting together my scone recipe for this month’s Gluten Free Ratio Rally, I referred to several scone recipes I had made in the past before I started baking gluten free. I like my scones moist on the inside as opposed to dry, so I decided to try a scone recipe that included eggs (or in this case, an egg equivalent). The ratio I followed was 3:1:1:1 Flour/Fat/Liquid/Egg. For my flours of choice, I used a mixture of millet, quinoa, sweet sorghum, chestnut flour (which I used for the first time in this recipe! ), glutinous rice flour (to help bind the ingredients together), and tapioca starch (to lighten up the dough a bit). After making a few batches of scones, I chose a ratio of flours to starch of 1:1, as too little starch resulted in a rather dense and heavier scone. In total, I used 300 grams of Gluten Free Flour Mix. Fortunately, I have a kitchen scale that I purchased several years back when a large retailer went out of business. It’s not fancy, but it does the job. One thing I hadn’t thought about was how easy weighing the flours out was. It was so much easier and faster than measuring using cups. I just added one flour at a time, one right after the other, into the weighing bowl. Since we have a dairy/soy/almond allergy in addition to gluten, I have been using So Delicious Coconut Milk and So Delicious Coconut Yogurt a lot, so these served as the liquid in my scones (100 grams in total). For the egg, I substituted a mixture of applesauce, egg replacer, water and baking powder (based on a recipe I found on Kim’s Cook It Allergy Free) (100 grams in total). For flavoring my scones, I went with a tropical theme, reminiscing about my family’s vacation in Hawaii last summer. Coconut, Pineapple, Mango, and Macadamia Nuts. This recipe uses coconut in all forms — coconut sugar, coconut oil, coconut milk, coconut yogurt, and coconut flakes. Although coconut contains saturated fat, this saturated fat consists of medium chain fatty acids (“MCFA”) as opposed to long chain triglycerides (“LCT”) found in animal fat. Whereas LCT has been linked to heart disease and a number of other chronic conditions, MCFAs such as lauric and capric acid have antifungal, antibacterial and antiviral properties. Plant based lauric acid is believed to help prevent high cholesterol levels and high blood pressure. Don’t get me wrong, these scones are an indulgence, although they’re healthier than most traditional scones. Since these scones are dairy free (no butter or cream) and egg free, these treats are cholesterol free; however, they are not fat-free. Savor every bite. I can’t even begin to describe the aroma as I removed these Coconut Pineapple Scones from the oven! Spread with a spoonful of Mango Butter (actually, there’s no butter or fat in this Trader Joe’s product), I felt like I was back in Maui, enjoying breakfast surrounding by palm trees and the Aloha sun! I found dried pineapple slices at Trader Joe’s, that were soft and chewy. Served with Trader Joe’s Mango “Butter” (really just a jam), I felt like I was back in Hawaii. 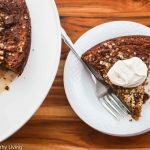 Feel free to play with this recipe, and try adding your favorite dried fruits and nuts in place of the pineapple, macadamia nuts and coconut flakes. I also used this recipe and added mini chocolate chips and dried cherries. These are best eaten the same day. There’s nothing like the aroma of freshly baked Coconut Pineapple Scones! To make Gluten Free Flour Blend, weigh out flours for Gluten Free Flour Blend in scale bowl. To make Egg Substitute, mix Egg Substitute ingredients together in a small bowl. 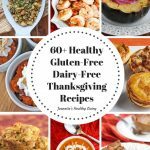 Place Gluten Free Flour Blend in <g class="gr_ gr_844 gr-alert gr_gramm gr_disable_anim_appear Grammar only-ins doubleReplace replaceWithoutSep" id="844" data-gr-id="844">food</g> processor, along with baking powder, <g class="gr_ gr_845 gr-alert gr_gramm gr_disable_anim_appear Punctuation only-ins replaceWithoutSep" id="845" data-gr-id="845">salt</g> and coconut sugar. Process until combined. Add coconut oil, coconut milk, yogurt, vanilla, Egg Substitute and coconut flakes. Process until just combined. Do not over-process. Turn out onto a lightly floured (use tapioca starch) pastry sheet and gently knead in pineapple and macadamia nuts. Form dough into a circle and pat to a 3/4" thickness. Cut into 6-8 wedges, depending on how large you like your scones. Place wedges on a parchment paper lined cookie sheet. Brush lightly with coconut milk and sprinkle with some coconut sugar and coconut flakes. Bake 10-12 minutes until lightly browned and baked through. Weighing out flours is actually a lot easier and faster than using measuring cups! Place Gluten Free Flour Blend in food processor, along with baking powder, salt and coconut sugar. Process until combined. Add coconut oil, coconut milk, yogurt, vanilla, Egg Substitute and coconut flakes. Process until just combined. Do not over-process. Turn out onto a lightly floured (use tapioca starch) pastry sheet and gently knead in pineapple and macadamia nuts. Be creative with your mix-ins. Use your favorite dried fruits and nuts. Form dough into a circle and pat to a 3/4″ thickness. Cut into 6-8 wedges, depending on how large you like your scones. Form dough into a circle, about 3/4″ thick, then cut into wedges. These scones have mini chocolate chips and dried cherries. U.S. News and World Report: Does Coconut Oil and Coconut Water Provide Health Benefits? 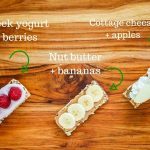 SoDelicious Dairy Free: Why Coconuts? That looks delicious! Great Pictures! Hi Jeanette! What an incredibly scrumptious, tropically-inspired idea! And how brilliant to pair these scones with mango butter! We are literally salivating over your photos, and we cannot wait to try this recipe. Thanks so much for sharing it! 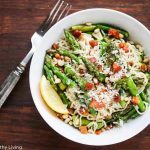 This is an absolutely wonderful recipe! I love coconut and pineapple together! It is such an awesome flavor combo! I will totally have to make this recipe. Your photos are just gorgeous, by the way. And is my mind playing tricks on me or did you re-design your blog header? It looks beautiful!! Thanks everyone, these scones smelled so good coming out of the oven! Yes, Kim, I just redesigned my blog header – I'm glad you like it. 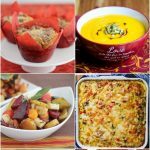 Jeanette I love your recipe and how it is open to variations. I want to play around more with scones. I'm definitely going to try out your recipe. Well done! Mmmm these look wonderful – and that glaze!!! yum. Jeanette these scones have got to be beyond fabulous! I have never had chestnut flour, but will now be on the lookout for it. Fun being in the rally with you. I am learning so much! Thanks Jenn and Marla, this has been such a fun event – I am amazed at all the different scone recipes, so creative and inspirational! Jeanette, these scones sound wonderful. I love that the Rally has convinced you of the benefits of baking by weight! And you've made me wish I lived closer to a Trader Joe's – I would love to have some mango butter! Baking by weight for this event was a terrific experience. I was always curious why it was so important in baking, and now I know why. I love Trader Joe's, we're fortunate to have one in our area. They're very reasonably priced and offer lots of products without any preservatives, artificial colors and flavors. These look so good – can't wait to try them! those look amazing. <3 coconut and pineapple. 🙂 now I fully understand as well why things didn't work before, but do now. it is awesome. Marly – thanks! Hope you have a chance to try these. Brooke – loved your coconut scones. What a fun event to participate in!